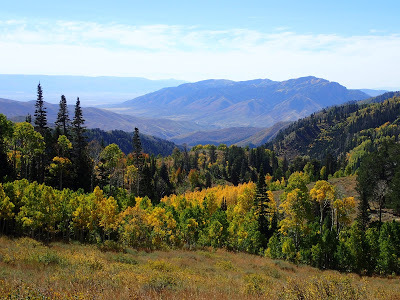 Mt Nebo is the apex of the famed Wasatch Range of Utah. 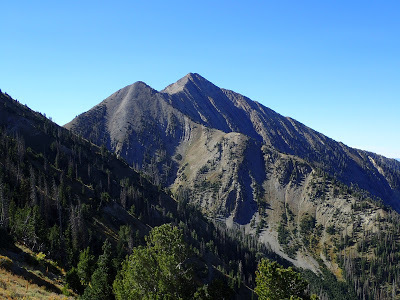 Although lesser known than other summits in the area, its jagged ridge line dominates the skyline of greater Salt Lake City. Climbing to the top isn't an easy feat. Naturally, I couldn't leave the state without climbing the highpoint of the Wasatch Range. 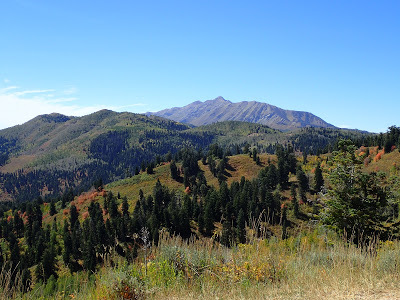 Often overlooked by summits closer to Salt Lake City, the impressive rise of Mt Nebo is appreciated on the drive up the Nebo Loop Road. This time of year, the drive was full of autumn splendor. I never realized how gorgeous a Utah fall could be. Of course, I didn't see this at first as I was driving up in the very wee hours of the morning. 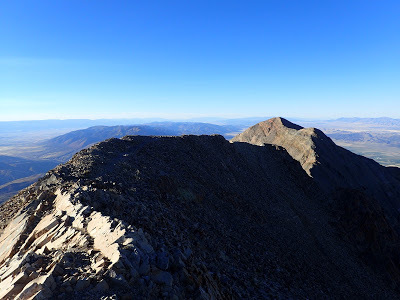 My plan was to climb this mountain and hopefully be at or near the summit right at sunrise. As it turned out, my timing was perfect. Here's the route I took. Generally well marked, however the final part is a total scramble. The last 400 vertical feet are basically a free for all. Starting at the parking lot, the trail hugs a small ridgeline with a fence.I tried to take in the glorious glow of the starlight knowing that I would not have this view back in Chicago. Though the greater Salt Lake City's metro area obscured some of the starlight to the north and west, I could pick out nearly every constellation with ease. With no moonlight, the Milky Way was so bright I was nearly casting a shadow. The trail gains quite a bit of elevation as it seems to head away from the summit. The smaller North Peak looms over to the South which almost looks like the true summit. 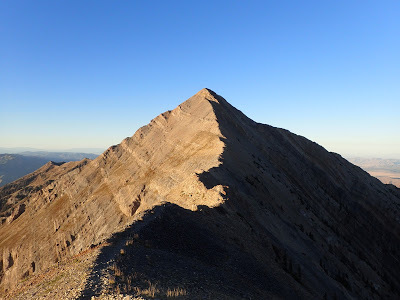 However, the trail circulates around this peak before the sharp profile of Mt Nebo comes into view. 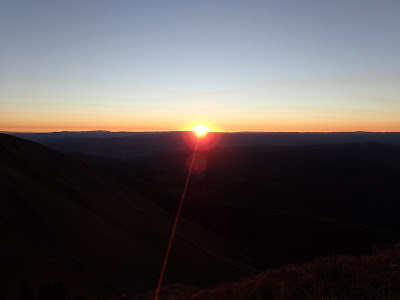 First light was breaking as I broke about 9,000 ft. Still with another 2,000 to go, I picked up the pace. 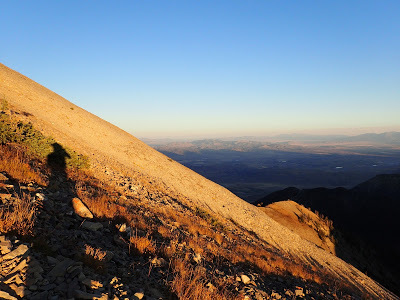 As the trail skirts just west of the summit of North Peak, it flattens out and loses a bit of elevation. Not used to breathing this thin air, I was happy for the relief. 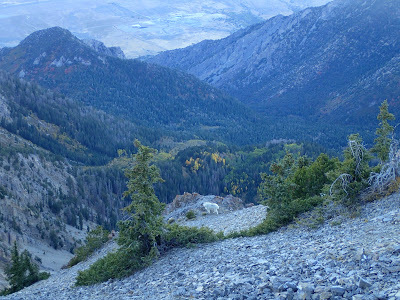 Eventually, I came to the saddle known as Wolf Pass. 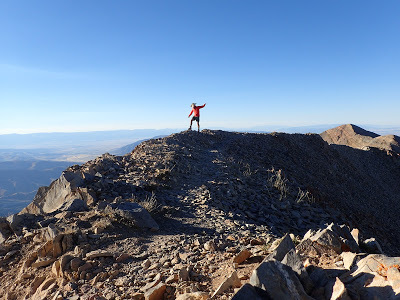 The final 400 feet of climbing which were just above the false summit was a full on scramble. Its quite exposed too- certainly was enough to keep my heart racing at nearly 12,000 ft. I used a combination of a hiking pole and a bare hand to slither up the final part. It was a delicate balance but I made it. The summit, of course, had a phenomenal view. 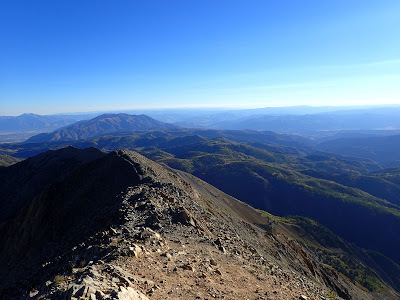 At the highest point in the Wasatch range, I could see for well over 50 miles. It was a fine way to finish my Utah Trip. Its an out and back hike so there was another struggle to get down. However in the mid morning I could now appreciate all the fall colors. Massive strands of quaking aspens were various hues of yellow this time of year. I really did come to Utah at jut the right time. Hardly a soul was on most of the trails but the weather was perfect for hiking. Mid September will always be my favorite time for travel. Great report…I wanted to do this one back in October, but had a snow/lighting storm halt my progress…oh well at least I had a good trip in Zion.